The future have repeatedly sent a strangely heavy accented cyborg back in time for numerous violent purposes, and safe to say we’ve seen ’em all. This time however, seems it was not Skynet nor The Resistance that sent one to alter history. It’s the writers and the producers. They sent Arnold Schwarzenegger back in time with a new mission, to rewrite the franchise. Is it a reboot? Is it a sequel? Surprise, it is both. And so as the old testament begins with the book of Genesis, the new Terminator starts with Genisys. Those familiar with the Terminator mythology can skip pass this section and join in after the break. But if you’ve been living under a rock for decades, the origin is as follows. Once upon a time, arrogant human beings, or as some call it, Americans, created Skynet, a highly intelligent AI that controls defense systems. Alas, it has a will of its own and decided to eradicate human with nuclear weapons. Judgment Day happened. Machines won and ruled with its own army of robots, while a handful human survivors band together to fight, lead by one John Connor. Having repeatedly failed to kill Connor, Skynet built a time machine to send one killer cyborg to 1984 to kill John’s would-be mother, Sarah Connor, before John is conceived. No mother, no child, machine wins, right? Not so fast, the resistance also sent one of their best soldiers through the time machine to protect Sarah. His name is Kyle Reese. They met, fought, survived and eventually conceived John Connor. That was the basic plot of the original, where Arnold Schwarzenegger was the indestructible evil T-800 ‘Terminator’ cyborg. Two sequels and one iffy Christian Bale attempt later, we arrive here in Genisys. 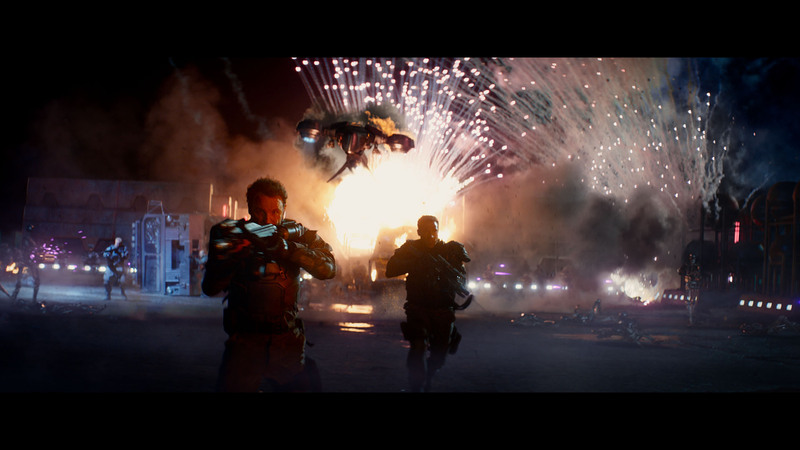 Terminator Genisys opens in said future where John Connor lead his troops to the final push, to stop Skynet from sending a Terminator with its time machine. Alas, as fate dictated, he was too late to change history, and can only fulfil his prophecy: send Kyle Reese time travelling to 1984 to save his mother. Here’s where it begins to twist, both the Terminator and Kyle Reese arrived in a totally different 1984 than expected. Instead of being an average Jane waitress as previous history wrote, Sarah Connor is a gun-toting ambulance-crashing girl who has been expecting Kyle and the Terminator’s arrival for 10 years. Even better, she somehow has her own old T-800 bodyguard whom she has trained herself. As Sarah told confused Kyle that the 1984 he expected has gone and changed, we the audience are also being told to forget what we’ve known about the franchise, and be ready for something different. The time-travel and history altering nature of the Terminator mythology enables creators to do just this, re-imagine things, do a reboot, while also being a sequel. So yes, this is a Terminator movie you’ve known. Yes, this is a sequel. But yes, this is also a reboot. And so as our cute new Sarah empties her .50 Cal Desert Eagle clip, we all went with her because we want to live. 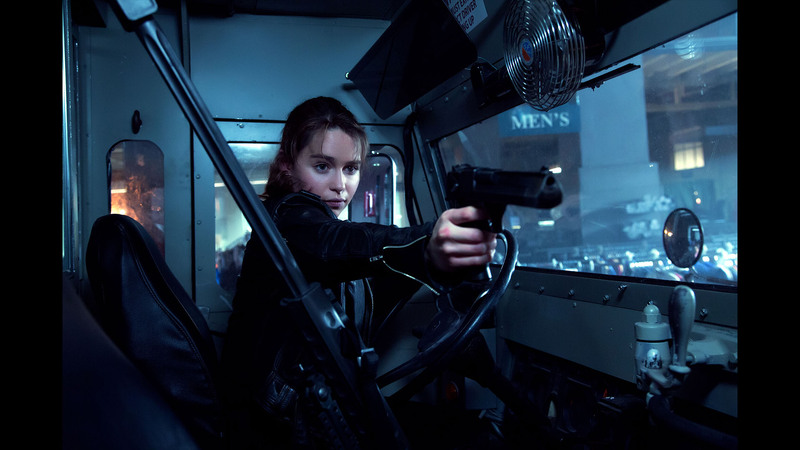 From that point on, Terminator Genisys unapologetically tries hard to change the mythology merely to keep the franchise and its aging star alive, while risking and causing audience confusion of having multiple time travel paradoxes. The biggest twist to the franchise this time around, is that somehow the future’s John Connor end up a cyborg/human hybrid, and ultimately the enemy. Donning facial injury to emphasize a battle hardened fighter, John Clarke works hard portraying that new John Connor, but probably succeeded better that time when he dealt with intelligent apes. 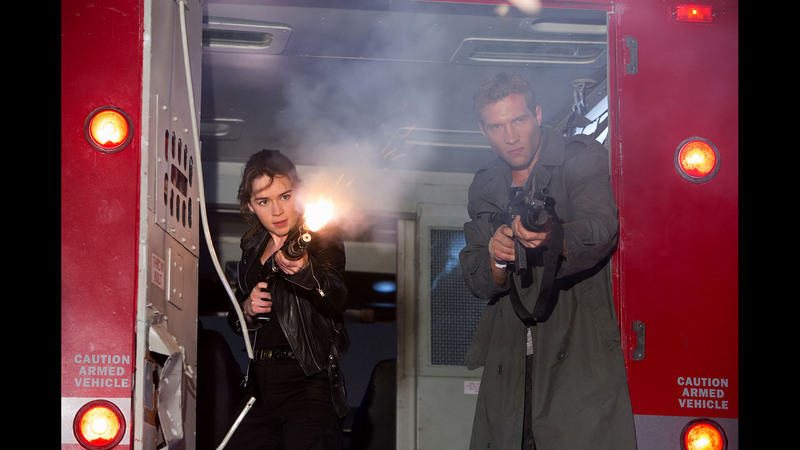 Jai Courtney plays confused time-travelling insurgent Kyle Reese, in a performance that while adequately fill its shoes, does not really show that he’s such a, um, ‘divergent’, actor. Probably generating whines from people unable to move on from the Linda Hamilton image of Sarah Connor, is the casting of relatively puny Emilia Clarke. Looking small with round-ish childlike face as opposed to muscle-y and hard jawed Hamilton, or even Lena Headey, Clarke’s new Sarah simply looks different. Get over it and you may see that this new approach is probably useful for making the ‘little girl and her old protective cyborg bodyguard’ plot work. Why not. If Daenerys can have Drogon, Sarah can surely have Pops. 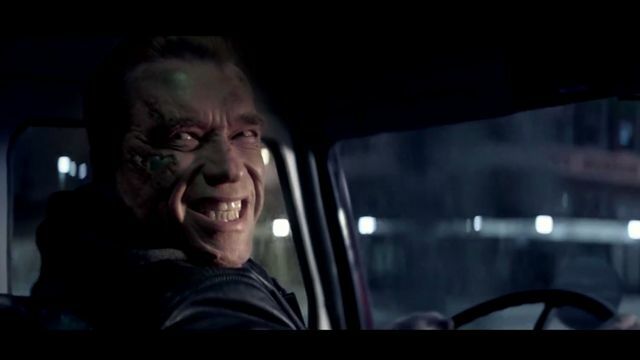 So finally, we come to Arnold, who took both center stage and side seat, putting his cyborg face on while repeatedly tries to convince us that despite having aged well, he’s still around for the part and we should be okay with it. Still menacing as a badass robot despite his age, Schwarzenegger made damn sure we know that this is his ultimate vehicle and not some moonlighting action gig like The Expendables. While we assume the word Genisys in the title have substantial meaning, in the actual plot it almost feels like an afterthought. It’s like the writers was just wanted a word that echoes Terminator’s biblical subtitle undertone, Judgment Day, Salvation, and now the book of Genesis. It just gave Kyle and Sarah something else to say besides ‘Skynet’. Not a big deal, we’re here for the action, right? Good news, all the cyborg morphing, gun firing, grenade lobbing, school bus flipping and helicopter chase are there. Not so good news, they’re really nothing that new nor exciting. With each instalment, the franchise tries to bring increasingly advanced enemy, but here they seemed to struggle in designing one. I mean, we’ve seen them morph, shape-shift, take bullets and self-heal before, what can this new tin-man do to wow the audience more? However, Genisys did give its old Terminator new tricks we haven’t seen before, among them are ageing, one-liners, and awkwardness. In the end I much prefer this because really, they’ve done all cyborg fantasy-tech south of making one that transforms into a huge red and blue trailer truck. Good move, I love it. I mean come on, look at old Pops there. 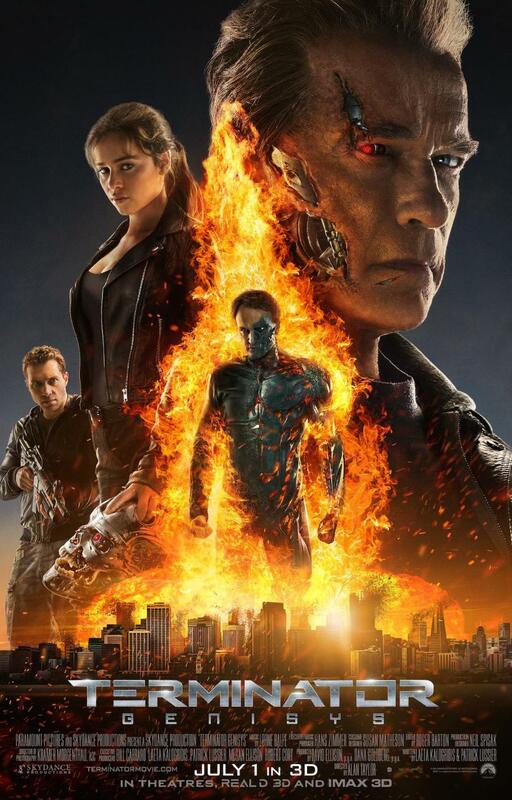 I had almost no expectation with Terminator Genisys, just a hope that it doesn’t end up bland. We’ve had versions of Sarah and John Connor, we’ve had Terminators that walks through walls, shape shifts, man, woman, half human. What new thing can they possibly offer this time around, especially having to feature and provide new vehicle for its now-aged main star? The writers and producers managed to pull something new from something old, even if it’s too risky and complicated. Surprisingly despite flaws, confusing story line, and so-so action scenes that are hardly new let alone memorable, Terminator Genisys managed to keep me interested from beginning to end. The crazy changes they made got me curious, wanting to see how this one will wrap. 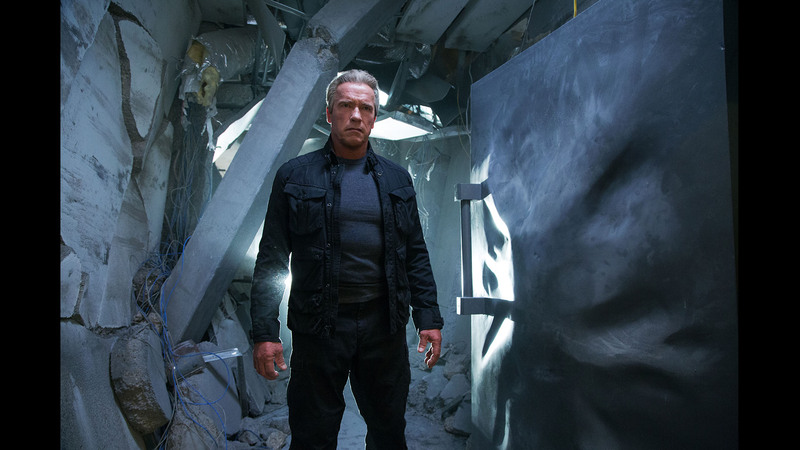 While many critics and fans slammed it as the worst of the franchise, and despite unanswered questions that probably will only be addressed in its next sequel, I left Terminator Genisys feeling more entertained and adequately satisfied than I was with T3 and Salvation. I had fun. The one thing I love about Genisys is that it’s got humor. Can’t recall the last time I had laughs and giggles watching a Terminator flick. Check it out and see whether you love or hate it, or perhaps think that it should be called Terminator Daenerys.